Why choose Better Rentals for your Tracked Loader Hire? Not just a “Dingo on Tracks” – great performance and productivity. Post Holes from 250mm – 600mm. All Inclusive Rates here on the website. No added Extras. Ever. Problems with a hire machine? Call 24/7 and a real live person will help. Why Hire a Tracked Loader instead of a Dingo or Bobcat with wheels? The traction on the tracked mini loaders has to be experienced to be believed. 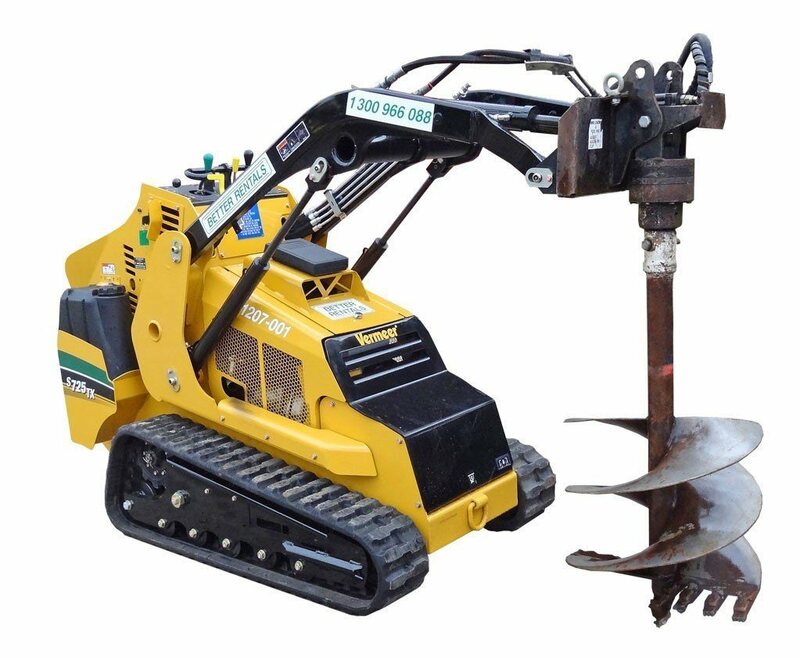 Where a wheeled unit will skid and so lose power – the tracked unit keeps driving – and digging. 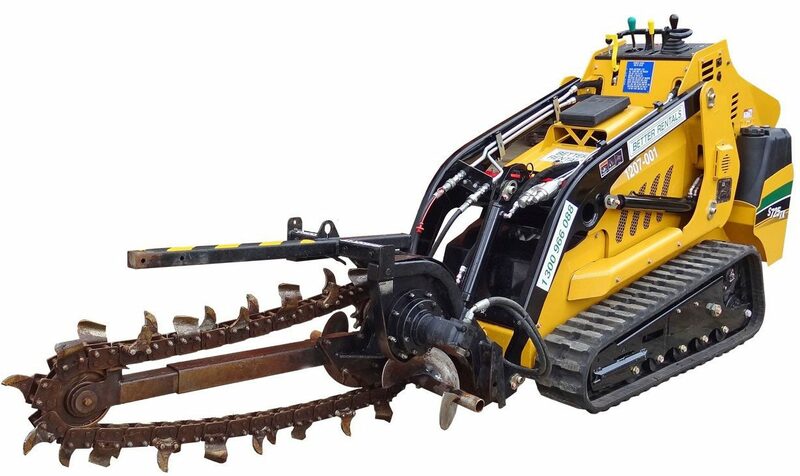 And the as the machine’s weight is spread over a larger area there is less damage to the ground making it perfect for use on turf as well as sandy and muddy ground. Try one once and you’ll see the higher hire rate (due to the higher purchase price and increased maintenance on the tracks) is often better value (depending on the size of the job of course). 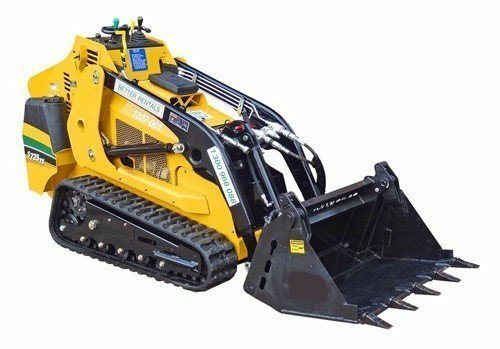 Tracked Loader Hire from Better Rentals? All New Fleet : Our entire fleet is Vermeer S725TX with diesel motors with purpose built aluminium trailers. Quiet, Modern and Safe You’ll be amazed (as we were) how smooth and easy to use for both the first time and experienced operator these loaders are. We check every loader before every hire for both safe operation – and to make sure they do what they’re designed. Our Hire Price is all inclusive : What we quote is what we charge with no hidden extras. 24 hour/7 day service : We’re dealing with machines and from time to time you may have a problem with your loader hire. Just call the branch you hired from and someone will help. We’ve plenty of Loaders for hire. But because our hire price is fair we do run out – especially at the weekends – so please call and book so you don’t miss out. And if dingo hire is a better option for your job we can help with those too. How Much to Hire a tracked loader? Our Tracked Loader Hire cost is fair for both you and us. Same Day Hire Rate – this is the hire cost when you collect and return on the same day (7.00am – 5.00pm) – or over night (4.30pm – 7.30 am next day). 24 Hour rate – the rate for 24 hours. Weekend Rate – the hire rate where the cherry picker is collected on Saturday morning and returned before 7.30am Monday morning. Of course we also have discounts for longer term hire – even a 2 day hire gets a pretty good discount off the daily rate. Since 1986 we’ve been the hire company of choice in Melbourne. Our four branch network covers the south East of Melbourne with stores in Cranbourne, Mornington, Ferntree Gully and Pakenham.